I normally try to keep this blog pretty general, keeping in mind that people are reading it all over the world. This month, however, we are focused on the San Francisco-Oakland Bay Bridge (or just the “Bay Bridge” as everyone calls it here), because it’s a momentous weekend. The eastern span that was damaged in the 1989 Loma Prieta earthquake is being replaced by a new eastern span that opened Monday night, almost exactly 24 years later (but half a day earlier than scheduled), after a 5-day long closure of this vital transportation link while they move the connections from the old bridge to the new one. Nonetheless, this is an earthquake story coming and going; having been started because of an earthquake in the previous millennium and resulting in new structure built to withstand the type of quake that is expected every one and a half millennia. I’ll give a bit of background here and then will link to a very interesting and informative story that appeared in the San Francisco Chronicle on Sunday, about the preparations for what was to have been Tuesday’s grand opening of the new Bay Bridge (although it opened ahead of schedule, Monday night). For those who live farther away, who may not be familiar with the Bay Bridge, this is the less-famous but more economically vital cousin of the Golden Gate Bridge. The two bridges opened within a year of each other: the Bay Bridge opened in 1936 and the Golden Gate Bridge opened in 1937. The Bay Bridge is a graceful double decker suspension bridge (actually two of them in a row, with an anchorage in the middle) connecting San Francisco’s east coast to Yerba Buena Island in the middle of the Bay, then turns into a two-level tunnel through the island, and then continues to the East Bay (Emeryville and Oakland) via what has been a utilitarian double decker cantilever bridge full of metal girders that looks, well, let’s just say that San Francisco definitely got the better end of the deal from an aesthetic standpoint. It’s about 4.5 miles from start to finish and is the main auto transportation link between San Francisco and Oakland. On October 17, 1989, the Loma Prieta earthquake hit the San Andreas Fault just south of the San Francisco Bay Area, 6.9 on the Richter Scale. In addition to the many other problems caused by the quake, a section of the top roadway on the eastern span of the Bay Bridge collapsed onto the lower deck, killing a motorist and causing transit havoc. 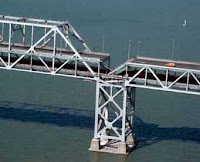 The eastern span was built on Douglas fir tree trunks driven about 100 ft into the mud at the bottom of the Bay, which is subject to liquefaction during large earthquakes. Furthermore, the bridge was not built to withstand the horizontal movement and one section of the top deck literally slid off of its support. The bridge was repaired and reopened, but it was clear that something had to be done about its continued inability to withstand earthquakes of the size that occur here every few decades. 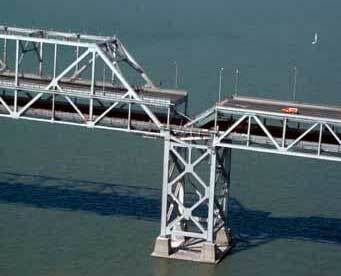 The western span was retrofitted a few years ago, but it was decided that completely replacing the eastern span was more economical than retrofitting it. After years of arguing about engineering and aesthetic design, construction begin in 2002 on a much safer, much prettier bridge. 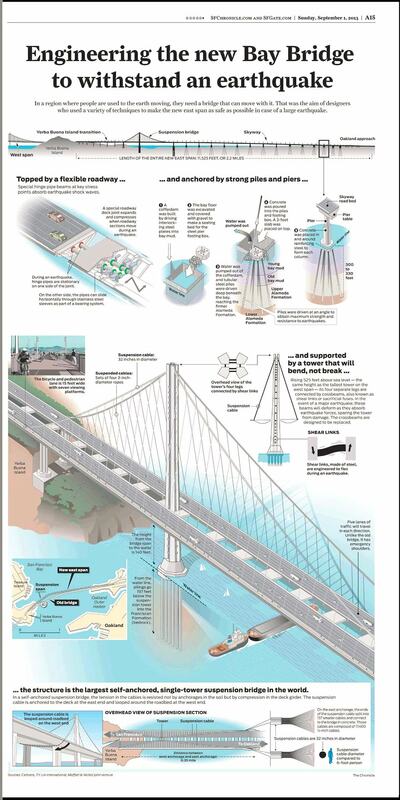 Despite cost overruns, continued design debates, and ironically, the discovery earlier this year that many of the bolts and seismic safety rods in the bridge were defective, the technologically cutting-edge, self-anchored single tower suspension span started carrying traffic today. For some pretty incredible information about its seismic design (basically, just about every piece is only loosely connected to every other piece! ), check out this article that the San Francisco Chronicle ran on Sunday. I encourage you to flip through the photo gallery; some of those pictures give you a great contrast between the old and new bridges. One of them is actually a short video, which is also worth watching. There is a lot of extra information in a diagram that shouldn't be missed (this graphic on the Chronicle site currently has a technical glitch so that it can't be enlarged and is unreadable; I've notified them and have temporarily posted an enlargeable version here). Next, they start dismantling the old bridge. That should take them about 3 years. Unless, of course, the next big quake hits before they finish; that could shorten the job!